The origin of Superman is one of comics' most well-known, timeless classics. It's universally appreciated by men, women and children of all ages and nationalities, a true legend of pop culture past, present and future. So it should only seem natural that more than one creative team would want to take a crack at it over the years, right? Perhaps, and on several occasions that return to familiar territory has been backed by a valid reason. John Byrne's The Man of Steel, for instance, cast aside the silliness of the Silver Age and paved the way for a revitalized continuity and a more streamlined universe. It was a case of the right place, the right time and the right man for the job. So where's the pressing need for a similar retelling today? Geoff Johns makes the case that, while we've seen these events before, we've never seen them from this perspective. Through the innocent, inexperienced eyes of Clark Kent himself, we're promised a rare glimpse at the instincts and motivations that made the big blue boy scout what he is today, blemishes and all. It's a fair point, one that had the potential to really open a few locked doors behind the veneer of DC's most iconic character, but with a few exceptions Johns shies away the kind of introspection I was hoping for. Instead of sharing Kent's thoughts as he sees the skyscrapers of downtown for the first time or the hustle, bustle and selfishness of the pedestrians on its streets, we're merely along for the ride, and that's nothing new. We're also literally drowning in word balloons. Johns fills several pages with so much dialog, the artwork has to fight just to occupy some cramped gutter space. I can understand the need to introduce and define familiar characters such as Perry White and Lois Lane, to keep them familiar but also add a new layer so the retelling is justified. It's an ambitious goal, and often the only way to reach it is through bold dialog. That's not a problem for this author – his writing is clever and effective, and he especially nails the no-nonsense, "get the story at any cost" attitude that defines Lois. There's just so damn much of it, the plot's never given the chance to gather a head of steam. I admire the quality of his work, but I wish it were more concise. 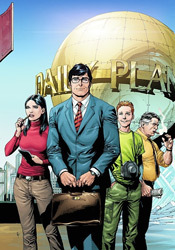 His artist, Gary Frank, captures the wide-eyed wonder of Clark's arrival in Metropolis with flair. I wasn't always a fan of Frank's work, but over the years he's made a believer out of me. It seems that with each appearance he adds a new layer of detail, discipline and polish to his work, and his take on Superman and company is no exception. Sometimes he does get carried away – as he does with Jimmy Olsen's buck toothed, freckle faced nerdy visage – but given the choice I'd rather see a page with too much character than too little. His more realistic, lifelike tendencies may have been out of place at Marvel, but he's a perfect fit for the DC style. Secret Origin is a valiant effort, but I didn't find the slight tweaks and irregular glimpses into Clark's psyche urgent enough to necessitate yet another stroll through such familiar terrain. It's only been five years since the last time we dredged up the Super-Origin (in Mark Waid's Superman: Birthright) and that's not enough time to move on. This is strong work, but that's hard to appreciate because its every move is so thoroughly telegraphed. Flip through it, but don't expect much. This Secret Origin runs surprisingly short on secrets.